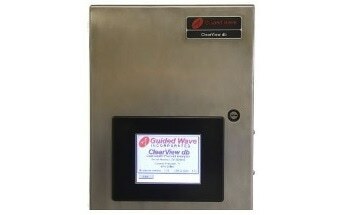 Guided’s Wave’s NIR-O process analyzer offers users a remote multi-channel extended range near-infrared (xNIR 1000-2100 nm) spectroscopic analysis, all the while providing an excellent signal-to-noise ratio, wavelength stability, NIST traceable wavelength calibration, dual beam optics and built-in diagnostics. One of the key features of the NIR-O process analyzer is attributed to its ability to monitor up to 12 process streams or points within a single stream, all the while ensuring the utmost accuracy, repeatability, and reliability during the process. 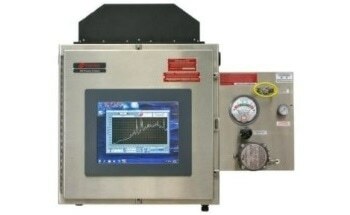 As a core component within a comprehensive process analyzer system that also includes the spectrometer, one or more NIR probes, fiber optic cables and OmniViewTM scanning and analysis software, the NIR-O process analyzer, like many other products offered by Guided Wave, utilizes infrared radiation to collect spectral data from a wide range of sample types including liquids, gases, glass and polymer-based films. All spectral data acquired by the NIR-O analyzer are interpreted by the OmniView software to determine the composition or physical characteristics of the material. Through the use of intrinsically safe fiber optic cables, the NIR-O process analyzer transmits light from the spectrometer to the applied process and back, thereby providing users with real time measurements at any time regarding accurate process information. 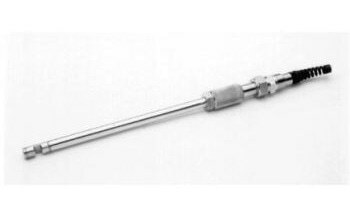 The NIR-O has been specifically designed to be used with Guided Wave’s 500 μm core jacketed fiber optic cable that contains a high purity fused silica core fiber which is surrounded by specialized jacketing to protect both the transmitted signal and the fiber itself. Additionally, this jacketed fiber optic also improves ease of use by allowing the analyzer to be located up to two hundred meters away from the application. Capable of being configured for up to 12 different channels or independent sample points, the NIR-O allows users to incorporate a varying amount of sampling points while maintaining an easy and economical method of sampling points as the applied process or facility requires. Furthermore, the NIR-O is also capable of measuring multiple parameters with a maximum of 12 independent sampling locations, in rapid succession through the use of a solid-state detector and digital optical switching technology. 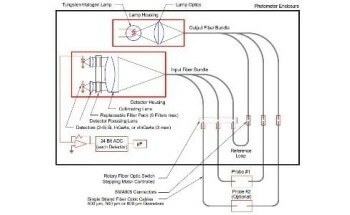 The usefulness of multiplexing has been proven to dramatically reduce the cost-per-measurement point during applied processes while also improving the economic cost-per-result. 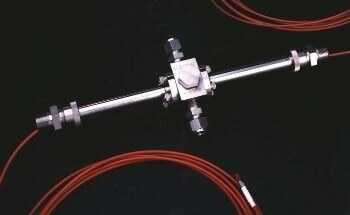 The dual beam design of the NIR-O process analyzer, combined with its high output near-zero aberration scanning grating capabilities allows for a greater amount of light to be provided to the fiber, thereby dramatically improving the signal-to-noise ratio and sensitivity in all acquired measurements. Each NIR-O provides users with an excellent wavelength accuracy (NIST traceable) and superb wavelength repeatability. The NIR-O process analyzer is a suitable tool for various online analyses of a wide range processes and process streams. With the built-in capacity to add more sampling points (maximum of 12 total channels) within the same process or across processes at any type of combination, the NIR-O provides users with an improved flexibility to ensure that their specific application requirements are met. 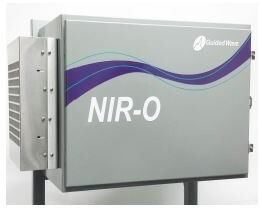 Additionally, the NIR-O significantly improves the user’s required investment for any future system expansions. NIR-O is compatible with all Guided Wave probes and flow cells, all of which can be used in any combination that is required for the user’s specific analytical needs. 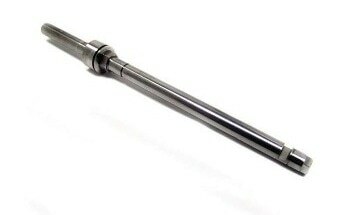 Note that the NIR-O operates within the xNIR range of 1000-2100 nm through the use of the process-proven TE-cooled InGaAs detector technology. Easy communication with the system is made possible through the use of the Modbus TCP over Ethernet connection. 12 channel NIR-O General Purpose (GP) enclosure shown. Dimensions will vary depending upon purge packages.